Background A growing number of studies indicate that sensationalist reporting of suicide is associated with increases in suicide rates, but in the light of some negative findings, the issue has remained controversial. The aim of this study was to evaluate the best current evidence on the association between celebrity suicide stories and subsequent suicides. Methods Literature searches of six data sources (Medline, Psychlit, Communication Abstracts, Education Resources Information Center, Dissertation Abstracts and Australian Public Affairs Database (APAIS)) were conducted. Studies were included if they (1) adopted an ecological design, (2) focused on celebrity suicide, (3) had completed suicide as outcome variable, (4) analysed suicide rates across all suicide methods, (5) used data from after World War II and (6) satisfied basic quality criteria. Results 10 studies with totally 98 suicides by celebrities met the criteria. The pooled estimate indicated a change in suicide rates (suicides per 100 000 population) of 0.26 (95% CI 0.09 to 0.43) in the month after a celebrity suicide. There was substantial heterogeneity between studies, which was explained by the type of celebrity (entertainment elite vs others) and the region of study, as indicated by mixed-effects meta-regression. The region-of-study–specific effect of reporting a suicide by an entertainment celebrity was 0.64 (95% CI 0.55 to 0.73) in North America, 0.58 (95% CI 0.47 to 0.68) in Asia, 0.36 (95% CI −0.10 to 0.61) in Australia and 0.68 (95% CI 0.51 to 0.85) in Europe. There was no indication of publication bias. Conclusions Reports on celebrity suicide are associated with increases in suicides. Study region and celebrity type appear to have an impact on the effect size. Despite this, debate continues about the actual impact of suicide reporting on suicide rates.5 ,18 ,19 There are several narrative reviews available which indicate a substantial heterogeneity with regard to individual study findings, including some negative findings.4 ,5 ,18–21 To date, no systematic meta-analysis has been conducted in which estimates have been provided on the cumulative effect size related to copycat behaviour. The current meta-analysis was conducted with a view to filling this gap. It systematically identified and brought together the findings from relevant studies. Studies dedicated to the effects of media reporting on suicide can generally be classified into (1) descriptive studies (ie, studies of individual cases or a group of individuals with no comparator) and (2) analytical studies (ie, studies involving a comparison with another group).4 ,20 The analytical studies can be further divided into (2a) individual-level and (2b) ecological studies. The vast majority of analytical studies in this area have been ecological studies and have analysed the possible effects of media reporting on aggregated suicide rates, using ecological before-and-after designs. These studies are generally of low specificity (ie, cannot demonstrate that those individuals who subsequently died by suicide were exposed to the media stimulus).4 ,20 Some individual-level studies have been conducted in this area.4 In these studies, the outcome variable is typically a self-reported attitude towards suicide or a likelihood of suicidal behaviour. Individual-level studies overcome the problem of low specificity but are not appropriate for examining the most important outcome of interest, which is completed suicide.4 For this reason, the current review is limited to ecological studies. The Oxford Centre of Evidence-Based Medicine classifies well-conducted ecological studies as only level II studies, indicating that evidence from these types of studies is generally lower than that from well-conducted randomised clinical trials and cohort studies.22 Practical and ethical considerations make it almost impossible to conduct randomised clinical trials and cohort studies in this area. 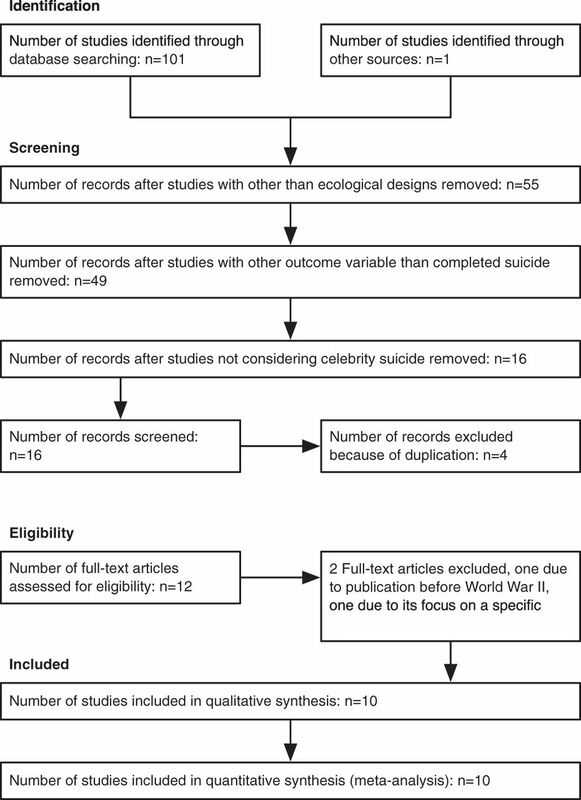 For these reasons, we aimed to systematically review the available ecological studies in order to evaluate the best current evidence on the association between reporting of celebrity suicides and suicide rates. Studies were eligible if (1) they adopted an ecological design comparing two or more time points before and after a suicide broadcast in the same population; (2) they focused on media reporting of celebrity suicide; (3) they had completed suicide as an outcome variable; (4) they analysed suicide rates across all suicide methods (deemed important because the evidence suggests that reports of suicide likely to have method-specific effects on suicide rates)7 ,9; (5) they used data from after World War II (because only a small proportion of the population would have been exposed to the media before World War II compared with the after-war period)23 and (6) met basic quality criteria, namely (i) the presence of a clear definition of the ‘celebrity term’ used in the study or a description of the celebrity analysed, (ii) the adequate reporting of statistical procedures which would allow for the repetition of the analyses made when the original data were available and (3) absence of any obvious flaws in the design or conduct of the study derivable from an in-depth reading of the relevant article. Editorials, comments and all other publications were excluded if they did not present primary or secondary data. Data on celebrity suicides that were reported in several studies were counted only once. This selection process yielded 10 studies. For an overview of the process of study selection, see the flowchart presented in figure 1. The data extracted for each study were (1) the name of the country where the study took place; (2) the publication year; (3) the mean population size across the observation period of the respective study; (4) the number of celebrity suicides that were analysed; (5) the type of celebrity, based on previously developed taxonomy13; (6) the mean difference in suicide rate in the month before versus month after the media reporting; (7) the standard error (SE) of the difference and (8) a short description of the portrayed suicide(s). For four studies which did not report the difference in suicide rates and the SE of the difference,7 ,13 ,15 ,16 the data were obtained from authors. This was made easy by the fact that we shared coauthors who had access to all the original data of these studies (SS, TN and K-wF, respectively). Population sizes were obtained from relevant national statistical agencies if they were not stated in the particular study. All coders were familiar with the literature analysed. TN, K-wF, PSFY and JP extracted the data independently using a piloted Excel template and compared the extracted data afterwards, reaching an agreement rate of 100%. We used mixed-effects meta-regression to determine which factors might be contributing to the observed between-study variation. We examined five variables: region of study (North America (reference group), Asia, Australia and Europe), decade of publication (2000–2011 (reference group) and 1980–1999), number of celebrities investigated (an integer), population size (taking the year average within the observation period of the respective study) and type of celebrity with regard to professional group and national identity (national entertainment elite, foreign or less known celebrity, mixed sample (reference group)). The region-specific and time-specific variables were included because it was thought that the sociocultural circumstances associated with them might have an impact on the amount of copycat behaviour.5 ,29 ,30 Furthermore, we included the number of celebrities analysed in the respective study because the way the term ‘celebrity status’ is defined in a study may have an impact on any association with suicide rates. Definitions used to define celebrity status vary widely across studies on celebrity suicides and seem likely to be more inclusive of relatively less famous individuals in studies analysing the associations of several celebrity suicides with suicide rates compared with studies dedicated to the analysis of the effect of one specific celebrity suicide. The model was statistically adjusted by using Knapp and Hartung34 method to help control the risk of spurious findings. The Variance Inflation Factor was calculated to diagnose the model's multicollinearity. If its value is larger than 10, this is an indicator of severe multicollinearity in the model.35 The number of celebrities was strongly correlated with the year of publication (Pearson's r=0.65) and with population size (r=0.63). The other study characteristics did not show multicollinearity. Review by a research ethics committee was not required for this work because of the use of published aggregate data. The study was conducted in accordance with the Declaration of Helsinki. Figure 2 shows the forest plot. The random-effects summary estimate of the 10 eligible studies on 98 celebrity suicides indicated an average increase in the suicide rate of 0.26 (95% CI 0.09 to 0.43) in the month after a report on a celebrity suicide. The heterogeneity test indicated significant between-study variation (I2=91%, Q=66.8, p<0.0001). Forest plot of effect sizes, that is, changes in suicide rates per 100 000 population in month after celebrity suicide, and 95% CIs from 10 included studies that assessed the influence of celebrity suicide on suicide rate in the community. The pooled random-effects estimate and the corresponding 95% CI are also shown at the bottom. Table 2 shows the results of the mixed-effects meta-regression model used to identify possible sources of heterogeneity. Type of celebrity (national entertainment elite) and region of study (Australia) were found to be statistically significant. The coefficients of the other explanatory variables were not significant. The variables number of celebrities and population size were not used in the analysis because of strong multicollinearity in the resulting model, yielding inflated Variance Inflation Factors. The heterogeneity test for the meta-regression model indicated no remaining statistically significant between-study variation (QE (df=3)=0.40, p=0.94). In summary, type of celebrity and region of study appeared to explain the observed heterogeneity. If a study of a national entertainment elite's suicide was published between 2000 and 2011, the effect was 0.64 (95% CI 0.55 to 0.73) if the study was undertaken in the North America. If it was an Asian study, the effect size was estimated at 0.58 (95% CI 0.47 to 0.68). If the study was conducted in Australia, the estimate was 0.36 (95% CI −0.10 to 0.61), and if it was a European study, the estimate was 0.68 (95% CI 0.51 to 0.85). If a celebrity was foreign or less known to the public, the effect was estimated at 0.16 (95% CI 0.01 to 0.31) for studies conducted in the North America and 0.09 (95% CI 0.04 to 0.15) for Asian studies. For studies conducted in Australia and Europe, the coefficients were not statistically significant and estimated at −0.13 (95% CI −0.35 to 0.09) for Australian studies and 0.19 (95% CI −0.01 to 0.40) for European studies, respectively. Figure 3 shows the funnel plot. The distribution of effect estimates seemed to be rather symmetrical, suggesting no direct evidence of publication bias. Both rank correlation test (Kendall's τ=0.31, p=0.21) and regression test (z=0.98, p=0.33) were not significant and supported this interpretation. Funnel plot of the observed outcomes in 10 studies on the association of celebrity suicide reporting with actual suicide rates. Each dot represents a different study. This study provides novel cumulative insights into the association between news stories about celebrity suicides and suicide rates. It summarises the strength of the effects in the literature and contributes to the examination of variables that moderate the effect. The pooled estimate of the 10 eligible studies on 98 celebrity suicides indicated an average increase in the suicide rate of 0.26 (95% CI 0.09 to 0.43) in the month after a report on a celebrity suicide. There was substantial heterogeneity between studies, which could be explained by the continent where the study was conducted and by the type of celebrity whose suicide was reported. Effects were most pronounced after reports on suicides by national top entertainers. 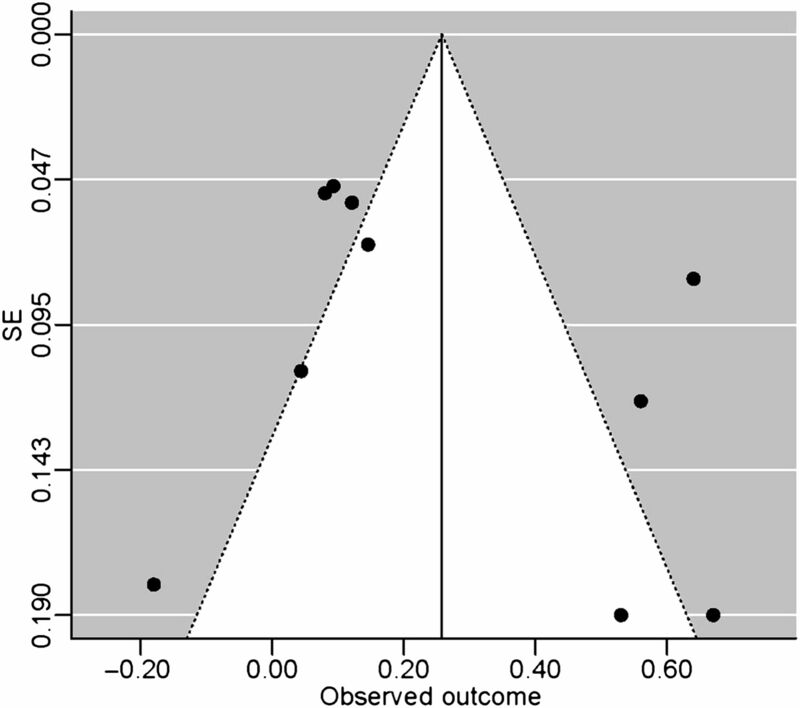 There appeared to be no publication bias as indicated by a funnel plot and related statistical tests. The main strength of the present analysis is the extensive and systematic literature review which used a wide set of search terms and databases. This is likely to have exhaustively identified studies in the topic area. A further strength is the independent extraction of data from the studies by several individuals, which resulted in complete agreement concerning the data used for the analysis. Furthermore, the selection of studies that met predefined quality criteria resulted in the inclusion of studies with acceptable quality. This study also has limitations. Like the primary studies included in this review, this meta-analysis could only identify temporal associations and could not establish causality.41 Furthermore, our emphasis on celebrity suicides meant that only 10 studies were eligible for inclusion, which had implications for the statistical power of the analysis. We justified this restriction on the grounds that celebrity suicides are the most likely to be reported and to have the largest impact on suicide rates, but it influenced the level of precision of our results. Further research is needed to investigate the potential impact of study region on copycat behaviour. In particular, studies investigating international differences in the quality of suicide reporting and the association between regional reporting quality and suicide rates are needed. The present study also indicates that more uniform approaches to study design and definitional issues are necessary to facilitate a comparison of studies. This meta-analysis has clear public health implications. It confirms that particular caution is necessary when reporting suicides by celebrities. Celebrity suicides will always be reported because they are particularly newsworthy, and we are not suggesting that they be censored. Instead, we would argue that they should be reported in a responsible manner in view of the existing results. There are vulnerable individuals in the community who would be negatively affected by sensationalist reporting. This recommendation is consistent with international guidelines on media reporting of suicide.17 Public health professionals (particularly those working in the areas of mental health promotion and suicide prevention) should collaborate with media professionals to make sure that reporting minimises the risk of copycat acts. Reporting of celebrity suicides has repeatedly been found to be followed by increases in suicides. However, the topic has remained controversial because of some negative findings. Bringing together the data from individual studies from different countries into a single meta-analysis allows us to conclude that celebrity suicide is associated with increases in subsequent suicides. The effect size appears to depend on the region where the study is conducted and on the type of celebrity. Cautious reporting on celebrity suicide is necessary. The authors thank for the useful suggestions from the reviewers. This work occurred as a result of a collaboration between members of the International Association for Suicide Prevention's Suicide and the Media Task Force (http://www.iasp.info/suicide_and_the_media.php).
. The influence of suggestion on suicide: substantive and theoretical implications of the Werther effect. Am Soc Rev 1974;39:240–53.
. Suicide and the media. Part II: reportage in nonfictional media. Crisis 2001;22:146–54.
. Suicide in the media: a quantitative review of studies based on non-fictional stories. Suicide Life Threat Behav 2005;35:121–33.
. The relationship between media reporting of suicide and actual suicide in Australia. Soc Sci Med 2006;62:2874–86.
. Copycat effects after media reports on suicide: a population-based study. Soc Sci Med 2009;69:1085–90.
. The role of media reports in completed and prevented suicide—Werther versus Papageno effects. Br J Psychiatry 2010;197:234–43.
. Estimating the risk for suicide following the suicide deaths of three Asian entertainment celebrities: a meta-analysis approach. J Clin Psychiatry 2009;70:869–78.
. Modelling and suicide: a test of the Werther effect. Br J Soc Psychol 1992;31:295–306.
. Suicide and the media. Part III: theoretical issues. Crisis 2001;22:163–9.
. Celebrity suicide: did the death of Kurt Cobain influence young suicides in Australia? Arch Suicide Res 1997;3:187–98.
. Celebrities and suicide: a taxonomy and analysis, 1948–1983. Am Sociol Rev 1987;52:401–12.
. The impact of media coverage of the suicide of a well-known Quebec reporter: the case of Gaetan Girouard. Soc Sci Med 2005;60:1919–26.
. The influence of media reporting of the suicide of a celebrity on suicide rates: a population-based study. Int J Epidemiol 2007;36:1229–34.
. The effects of a celebrity suicide on suicide rates in Hong Kong. J Affect Disord 2006;93:245–52. World Health Organisation. Preventing Suicide. A Resource for Media Professionals. Geneva, 2008. http://www.who.int/mental_health/prevention/suicide/resource_media.pdf (accessed 27 Feb 2012).
. Is suicide contagious? A study of the relation between exposure to the suicidal behaviour of others and nearly lethal suicide attempts. Am J Epidemiol 2001;154:120–7.
. How robust is the Werther effect? A re-examination of the suggestion-imitation model of suicide. Mortality 2005;10:193–200.
. Suicide and the news and information media: a critical review. Mindframe, 2010. http://www.mindframe-media.info/client_images/900016.pdf (accessed 27 Feb 2012).
. Media roles in suicide prevention; a systematic review. Int J Environ Res Public Health 2012;9:123–38. Oxford Centre for Evidence-based Medicine. Levels of Evidence. Oxford, 2010. http://www.cebm.net/index.aspx?o=1047 (accessed 27 Feb 2012).
. The effect of the media on suicide: the great depression. Suicide Life Threat Behav 1992;22:255–67.
. Copycat effect after celebrity suicides: results from the French national death register. Psychol Med 2011;41:668–71.
. Introduction to Meta-analysis. Chichester, UK: John Wiley & Sons, 2009.
. Social correlates of suicide by age. Media impacts. In: Leenaars AA , ed. Life Span Perspectives of Suicide. Time Lines in the Suicidal Process. New York: Plenum Publishing, 1992:187–214.
. Mass media, cultural attitudes, and suicide: an international comparative study. Crisis 2001;22:170–2.
. Comparing Media Systems in Europe: Identifying Comparable Country Level Dimensions of Media Systems. Gothenburg: University of Gothenburg, 2010.
. Elites and Masses. New York: D. Van Nostrand, 1981.
. Stars. London: British Film Institute, 1998.
. Improved tests for a random effects meta regression with a single covariate. Stat Med 2003;22:2693–710.
. Applied Regression Analysis and Other Multivariable Methods. Boston, MA: PWS-Kent Pub & Co, 1988.
. The impact of media reporting of the suicide of a singer on suicide rates in Taiwan. Soc Psychiatry Psychiatr Epidemiol 2010;45:363–9.
. A dose-response relationship of imitational suicides with newspaper distribution. Aust N Z J Psychiatry 2001;35:251.
. Imitation and suicide: a re-examination of the Werther effect. Am Sociol Rev 1984;49:427–36.
. A reanalysis of the impact of non-celebrity suicides: a research Note. Soc Psychiatry Psychiatr Epidemiol 1990;25:269–73.
. The relative benefits of meta-analysis conducted with individual participant versus aggregated data. Psychol Methods 2009;14:165–76. Funding This work was supported by the Faculty of Social Science of the University of Hong Kong and a GRF grant (HKU 784210M) and benefited from a working meeting held in Hong Kong in 2010. The funding bodies had no role in study design, data collection and analysis, decision to publish or preparation of the manuscript.